Photo: Mount Mourne, ca. 1836, Mount Mourne, Iredell County, NC. Listed on the National Register of Historic Places in 1980. Photographed by User:Cdtew (own work), 2013, [cc-by-3.0 (creativecommons.org/licenses/by/3.0)], via Wikimedia Commons, accessed May, 2014. Iredell County administrative offices are located at 200 South Center Street, Statesville, NC 28677; phone: 704-878-3000. The story of Iredell County can be divided into five periods, some of them overlapping, others fairly distinct. There was a Frontier period, from the first settlers about 1719 until the formation of Iredell as a separate county in 1788. There was the Back Country period, from the formation of the county until the coming of railroads in 1858. Then came the Trading period, when Statesville had a monopoly on railroad transportation in the years just after the Civil War, a period followed by manufacturing when newer railroads took the trade to other towns. Finally, during the 20th century, came the Livestock period, then the agriculture of the county shifted from row crops to feed and pasture. The Trading period applies mainly to Statesville, and the Manufacturing period primarily to Statesvllle and Mooresville. The other three periods have been largely rural. The Frontier period began with the earliest settlers, just before 1750. Like other American frontiers, it was marked by its cowboys, homesteaders, Indians, and outlaws. During that period the section that has become Iredell was the western part of Rowan County, which was formed in 1753, soon after the settlers began moving in. 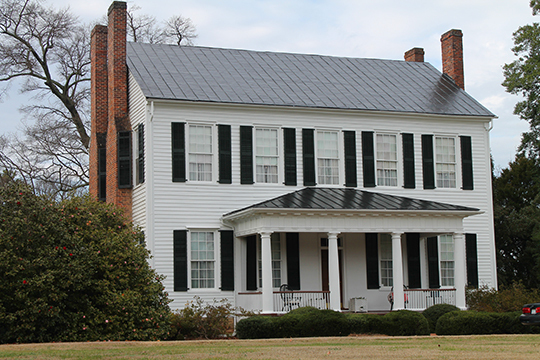 By the time Iredell was formed in 1788, most of the frontier aspects had passed from the scene. Land was granted after that, but most of the grants were made to speculators rather than to homesteaders. The Indians had been quieted in two wars. Whatever outlaws there were had lost the political connotation the term had acquired during the Revolutionary War, and the dream of making this a cattle country that some of the early settlers had faded into the background. The Back Country period was a time of isolation and subsistence farming. Transportation was poor, and it was not economically feasible to ship out many of the commodities produced. Wagons were occasionally sent to Charleston and other South Carolina ports with distilled liquors and leather and a few other manufactured goods, and salt and a few luxuries were brought back; but most of the goods manufactured in the homes and small shops were used at home. Statesville was a county-seat town where county court met four times a year and after 1808 the Superior Court met twice a year, but it was by no means a large town. By the end of the Back Country period its population was not much more than 200 souls. Statesville was lifted out of the rural back country suddenly in 1858, when the Western North Carolina Railroad came to town. The rest of the county felt the effects of improved transportation more slowly, but even then there was a wide difference between having to haul goods to market in Statesville and having to haul them to South Carolina. Statesville became a trading center where farmers from 17 counties brought their produce to trade it to the wholesalers for commodities which had been shipped in by rail. The Trading period did not end as suddenly as it began. From the mid-1890s until well into the 1900s there was a gradual shift in Statesville from wholesale establishments to factories. Before 1890 a railroad had been built nearer the mountains at Taylorsville and another one was approaching Wilkesboro up from Winston to the Yadkin. The Statesville leaders saw the handwriting on the wall, that a railroad to the foot of the mountains on the Yadkin would bring an end to the hegemony that Statesville held over much of its back country, and they began to preach manufacturing as a way to economic salvation. At the same time the citizens of Mooresville began organizing for manufacturing, especially textiles. During the Trading period the manufacture of tobacco and the blending of whisky by the wholesalers in Statesville played an important part in the economy of the town and county. There had been manufacturing from the first, but the movement that began in the 1890s, with its cotton mills, furniture factories, roller mills, and brick machines made manufacturing the main factor in the economic life of Statesville and Mooresville and had an impact on the county as a whole. Laura A. W. Phillips, Consultant, Catherine W. Bishir, N. C. Survey and Planning Branch, and Renee Gledhill-Early, Survey and Planning, North Carolina Division of Archives and History, Iredell County Multiple Resource Area (MRA), nomination document, 1980, National Park Service, National Register of Historic Places, Washington, D.C.